Ara takes us on a search for prehistoric remains at Kingsdown and comes up with some thrilling discoveries about possible Neolithic standing stones in the area. This is a totally new line of investigation and any contribution that you can make to the story will be appreciated. I have been living in Kingsdown for almost six years. During that time, I have walked along Lower Kingsdown Road on more occasions than I care to think of. Often during my walks, I would cut through Kingsdown Woods and on to Kingsdown Golf Course. I would casually note that some of the stones scattered along the lane or in the woods or even on the golf course itself looked like menhirs. Of course I never thought for a moment that they could have been menhirs; it was more wishful thinking based on what I had seen during my visit to many stone circles all over UK and Ireland, France and other regions of Europe and finally not forgetting the country of my roots, Armenia. 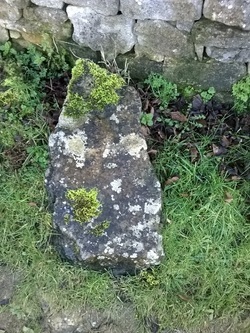 I am sure that most readers are aware that a menhir is a prehistoric monument consisting of a single tall, upright megalith where a megalith is defined as a standing stone of great size more often than not used in a stone circle which in turn is a monument of such stones used for pagan worship. Historians believe that stone circles developed in Britain from around 3000 to 2000 BC – in other words, during the later Neolithic period (when agriculture began in the UK) and moving into the earlier Bronze Age (when we see the first use of metals, from about 2400 BC). But back to my story. Why should I have believed that there was a stone circle in my own back yard as it were? After all, I knew that we were surrounded in our close vicinity by quarries, details of which have been well-documented over the years, namely Monkton Farleigh, Box and even Kingsdown. 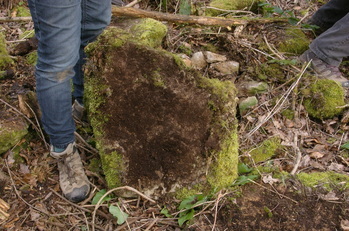 So any stones lying around were surely poor quality boulders dug out and discarded during open quarrying activities and subsequently weathered over the centuries to form such menhir looking shapes? Or perhaps they were created through some wonderful geological phenomena. Or could they just have been, with a big stretch of my imagination, menhirs that had once upon a time been part of a large stone circle? A much more exciting suggestion I think you would agree? Is Kingsdown Golf Course a Stone Circle Location? It was only after I had given my presentation at Box NATS in December last year, which was on the subject of the Ancient Armenian Civilisation and the Celtic Connection, and which had included many slides of stone circles that I had visited during my lifetime that it would appear that my eyes had popped open to the possible truth that there had indeed been a standing stone circle on the grounds of Kingsdown Golf Club. So the question now that must be asked is: Is Kingsdown Golf Course a likely location for a stone circle? 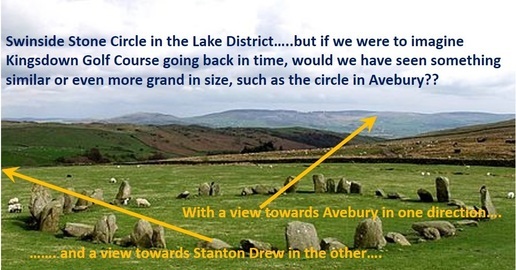 From the photograph (right) taken of Swinside Stone Circle, in the Lake District, one could easily picture a similar stone circle having existed on top of Kingswood Golf Course. 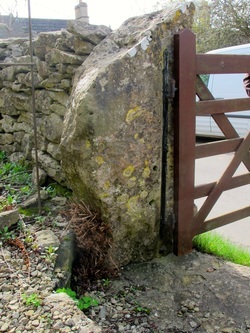 This would include the forty number or more menhir shaped stones scattered along Lower Kingsdown Road (some utilised as gate posts as can be evidenced in farming areas in Cornwall for example), in areas of Kingsdown Woods and of course on the golf course itself. For one who has walked on the golf course and knows the 360° panoramic views that are available from many of the fairways, one could picture the Celts having pin pointed a location for a stone circle that would have provided views of the hills near Calne in the one direction and the Bristol Channel in the other. So armed with my thoughts and my vivid imagination (ask my wife Nicky; she will readily confirm that!) I contacted other enthusiasts from the Box neighbourhood, namely Elizabeth Devon (well-known geologist and lecturer in geology), Marcus Mitchell (well-known stonemason) and Alan and Carol Payne (well-known gatherers of local knowledge). 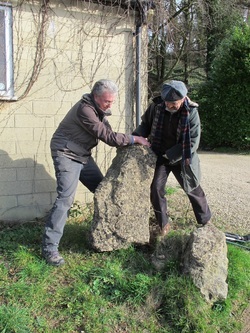 Together we formed the Kingsdown Stone Circle working party! This small but very excited working party arranged a time and date to meet, which luckily turned out to be a warm early spring day in 2014. We ventured along Lower Kingsdown Road, into the woods and finally onto the golf course, snapping photos of potential menhirs (having cleared off all the undergrowth to reveal their shapes, perhaps for the first time for decades). On completion of the tour of potential menhir-shaped stones, the working party adjourned to our stonemason’s cottage for a well-deserved cuppa and a discussion on the best way forward to establish firm facts (or otherwise) that would confirm (or otherwise) a possible Kingsdown Stone Circle. We poured over a Historical Map of Ancient Britain and to our delight and amazement, established that Kingsdown is half way between Stanton Drew Stone Circle and Avebury Stone Circle….and that all three locations are on a straight line! So as a reader of this article, are you convinced; or even mildly interested or just doubting that any of what I have written could possibly be true? Whatever your viewpoint, we would love you to let us know what you think. Perhaps you have some vital information that would be of great support to our belief that there had been a stone circle in Kingsdown a long time ago. One piece of information that I will conclude with is that we have been informed by a local resident that stones had been put on the Kingsdown Golf Course fairways to stop the Germans landing their aircraft during the Second World War. If this is true, then perhaps the menhirs that I have been referring to in this article had been used as such a deterrent (and later randomly dumped into the woods). Ara Krikorian and the Working Party intend to write up this fascinating article in more detail in our next issue. Before then, are you able to add to our knowledge of the stones on the Golf Course or of other local menhir finds?